The River Coquet, Northumberland`s finest river, rises on the upper slopes of Brownhart Law little more than the toss of a spear from the Roman military complex of Chew Green. The Pennine Way follows the high ground, where the international border fence acts as a welcome guide to those hardy, long distance walkers who step out across these remote and empty hills. As you wander the wide, open spaces, far from the epicentre of the Roman Empire, you will surely feel the tingling sensation of history running up and down your spine. You will enjoy faraway views across an ocean of little known hills. This is border country par excellence. 1. There is a small parking area (GR NT824107) less than half a mile west of Blindburn, where the Buckham`s Walls Burn enters the River Coquet, 9 miles from Alwinton, along a twisting, single track road. It is a journey to whet the appetite. In his splendid 1950 booklet `A Guide to the Cheviot Hills`, F. R. Banks wrote, “…..the road ends at Blindburn, and a cart-track continues thence, fording the now-diminished river at the foot of the Buckham`s Walls Burn”. A bridge now spans the river and the road continues to Fulhope, Makendon and beyond. There is a two fingered signpost alongside the car parking area indicating `Border Ridge 3` on one finger and `Deel`s Hill 1½ Border Ridge 2¾` on the other one. Your route heads towards Deel`s Hill so leave the car parking area at the rear, crossing a wooden bridge and a five bar gate. The gate is marked on one side with a yellow and blue `Public Bridleway` sign and on the other side with an `Archaeological Area` sign. Head steeply uphill on an obvious and good green track which, as you gain height, is punctuated by two five bar gates. Across the narrow valley, to your left, the long ridge of Fulhope Edge stretches out above the River Coquet, separated from the dark, heather clad summit of Thirl Moor by the deep valley of the Fulhope Burn. Both lie within the Otterburn Ranges, an area used by the Ministry of Defence (MoD) for live firing and, therefore understandably, access is severely restricted. As you continue upwards, you are now well on your way to your first top of the day and, when the track splits in two, continue with the left hand `public bridleway` spur. On reaching the third five bar gate and the accompanying directional fingerpost, be sure to continue towards Deel`s Hill. The track eventually contours the southern side of the hill so you will need to leave the track, just before it begins to descend, heading to your right to reach the 495 metre high grass covered summit of Deel`s Hill. There are now extensive views into Southern Scotland. 2. Return to the track and continue in the same general direction and after losing a little height, ignore the track turning off to the left. Keep following the directional fingerposts and when, after a short while, the `Public Bridleway` bends away to the right (GR NT796098) head straight on, rising gently uphill towards the border fence. Once you reach a three fingered signpost, take the faint track, diagonally to your left, which heads uphill alongside the fence in a south westerly direction, to the summit of Brownhart Law (GR NT787093). This hill is slap bang on the `Border Line` and, standing at a height of 508 metres, offers superb views. To the south lies the Roman military complex of Chew Green consisting of a fort, two fortlets and two camps all served by Dere Street. Constructed during the first century AD by Julius Agricola, the first Roman Governor of Britain, this road stretched from York in the south to the Firth of Forth in the north and, more locally, connected High Rochester with Melrose. As the military complex at Chew Green did not enjoy clear views to the north, a signal station was built near to the summit of Brownhart Law, an ancient and low tech example of an `early warning system`. To the north, the view into southern Scotland is extensive with Sir Walter Scott`s beloved Eildon Hills particularly prominent. 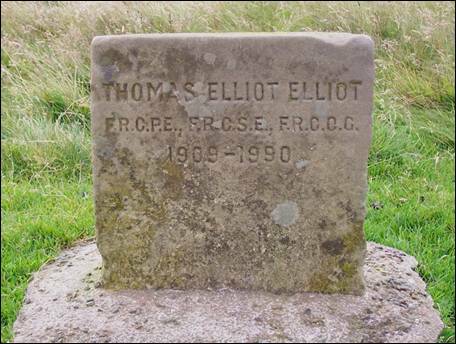 Take time to cross the fence and to head over the summit for some 50 metres where you will find a small memorial stone, barely knee high, to one `Thomas Elliot Elliot 1909-1990`. Now retrace your steps to the three fingered signpost, continuing towards Dere Street which climbs uphill from the military complex and reaches the border fence to the north east of this spot. You are now heading northwards on the route of the Pennine Way, as it makes its way along the high ground towards a distant Kirk Yetholm. You are also following a less well known long distance walk, The Roman Heritage Way, which follows in the footsteps of the Roman centurians who marched across these hills some nineteen hundred years ago. 3. Keep with the Pennine Way for just under ¾ mile and, on reaching a five bar gate through the border fence (GR NT788105) just beyond the summit of Black Halls, go through and continue along a rough track signposted `Dere Street Trowford 3` with the fence now to your right. You have stepped onto Scottish soil, en route to the farthest point of the walk, Woden Law, a 4 mile return journey from this point. Meriting barely a mention in James Logan Mack`s 1924 book `The Border Line`, a more recent traveller to these lonely parts, the well known writer and broadcaster Eric Robson, recommended, in his 2006 book of the same title, that Woden Law was `worthy of a detour`. Indeed it is. After some 600 metres the track breaks in two and your outward route follows the thin path which cuts away to the left, high above the Gaisty Burn. Another 500 metres on and it is time to make the short diversion via a thin trace on your left to the 459 metre high summit of Gaisty Law (GR NT780111) from where there are superb views down to the Hindhope Valley. Return by the same route except, when the path splits in two, be sure to follow the left hand fork. Back on course, the path contours the dizzy, south western slopes of Blackhall Hill and when you are parallel with Hunthall Hill, just before your way forward passes through a metal five bar gate (GR NT776117), turn to your left and make the short journey to the unmarked 420 metre high top, returning the same way. With four tops now in the bag, pass through the gate and continue downhill across the `neck` of land rising between White Hope and Twise Hope. Just before the path begins to bend away from the fence, turn left through a gate in the fence (GR NT772121) and head towards the summit of Woden Law on an obvious quad track. At the top of the first steep climb, just before the track drops downhill, cut across the pathless top of the small hill to your right to reach a post and wire fence. Climb over, turn left and keeping with the fence head towards a five bar gate further up the hill. Go through the gate and turn half right to cut diagonally up the last remains of the slope, along a barely discernible trace, to reach the extensive summit earthworks of Woden Law (GR NT766123). 4. 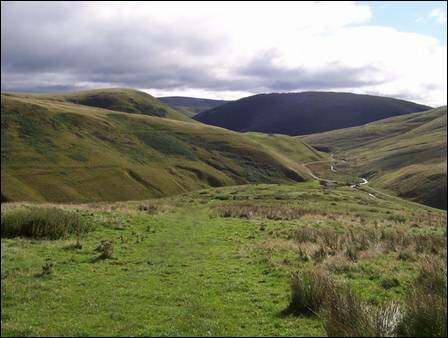 In his 1936 book `The Rambles of Vagabond`, Frederick A. Wills enthused “…..all around us lay deep and luscious valleys of pastures……rounded hills stretched away towards the Cheviot“ adding, “ascending the perfectly impregnable camp on the Law we focussed the glasses on Oxnam, Jedburgh, St. Boswell`s, the Eildons and Melrose”. More than 70 years on and you will see for yourself as you `potter` about this fascinating vantage point. Standing at a height of 422 metres, “the Law” is named after the god Woden, leader of the Wild Hunt and the Anglo-Saxon version of the Norse god Odin. It is strategically situated and was the location of an Iron Age hillfort. 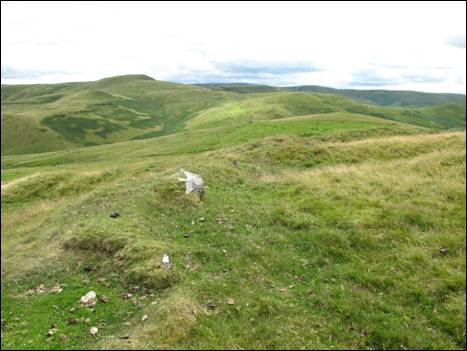 Eventually, the hillfort was used by the Romans for military siege practice, much like the Otterburn Ranges are now used by the MoD. Strange how history repeats itself! Retrace your steps to the small gate in the fence leading back onto Dere Street, turn to your right and begin your journey back up uphill towards the border fence. On reaching the metal five bar gate, encountered earlier on your journey and on this side bearing a notice `Dere Street Chew Green This Way`, do not go through. Instead, take the track on your left which climbs uphill, initially close to the fence, and eventually you will reach another five bar gate with a small rocky outcrop straight ahead. Pass by the rocky outcrop, known as Greyhen Rock (GR NT781119), and in less than 100 metres follow the quad track which heads to your right to the 481 metre high summit of Blackhall Hill close to a post and wire fence. This is your sixth and penultimate top of the day. Now turn left and stay with the fence until you reach the next five bar gate. Pass through. Now, with the fence firmly to your left, head straight on over rough ground with only the hint of a path to ease the way. As you ramble along keep a keen eye out for a particularly boggy patch which can catch you unawares. Eventually, you will rejoin your outward route and now it is a simple matter of following the clear track of Dere Street to the gate just short of the 463 metre high summit of Black Halls. Pass through, turn left and, once again on English soil, your journey for the next 2¼ miles follows, step for step, the route of the Pennine Way. 5. First suggested in 1935 by Tom Stephenson it took another 30 years of patient negotiation, supported by legislation, before more than 2,000 people could, on the 24th April 1965, gather on Malham Moor to finally celebrate the completion of the Pennine Way. It was to be another 40 years before the much broader and long fought for `Right to Roam` was finally achieved. The path, paved in two places, heads in a northerly direction across the slopes of Blackhall Hill before bending, like a boomerang, towards the east as it first crosses the head of the Buckham`s Walls Burn and then the source of the Rennies Burn. This area is particularly boggy with ground cover consisting mainly of heather, mat-grass and purple moor grass. The views continue to open up. 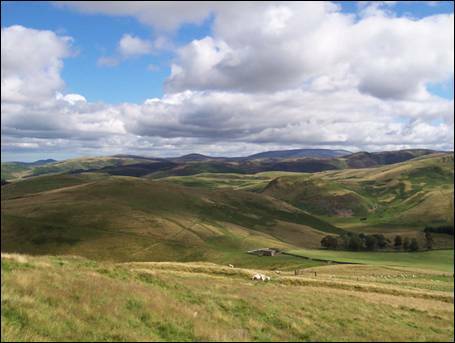 On the Scottish side lie the lush lowlands of the Teviot Valley and Tweedsdale whilst on the English side the Cheviot Hills appear to roll on endlessly to a distant North Sea coastline. A sudden right angle turn in the fence, to the left, sends the path down a grass covered slope to a sharp gap in the border ridge. This is Yearning Saddle and the point where you bid farewell to the Pennine Way. But first, spend a few minutes beside the wooden mountain refuge hut (GR NT804128), savouring the moment and perhaps sheltering from the biting wind. Time to make tracks, so leave the hut by following the waymarked green track in an easterly direction and, when in a short distance, the track splits in two continue with the right hand spur. Now aim for the next directional fingerpost and then continue along the `Public Bridleway` on one of the boggy parallel tracks. Nearby there is evidence of earth and stone enclosures together with the foundations of several rectangular buildings. These are thought to be the remains of a medieval or post-medieval farm. 6. You are now heading across the gentle western slopes of Yearning Law and when you begin to draw parallel with the summit the track, which now leaves the course of the `Public Bridleway`, bends to your left heading towards the 477 metre high rocky and prominent top (GR NT817118). From here there are extensive views across the great sweep of grasslands stretching back towards the high border ridge. Leave the summit and rejoin the track you arrived on. 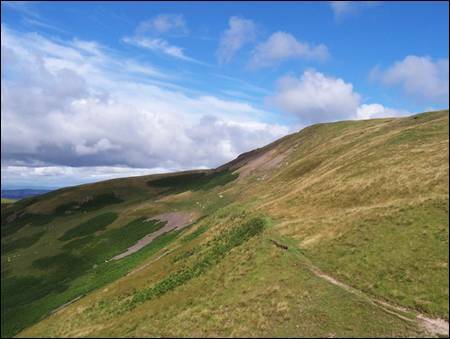 Turn left and stay with this track as it contours the south eastern spur of Yearning Law giving you tremendous views down to the valley of the Blind Burn. In time, you will merge once again with the `Public Bridleway` which now makes an easy descent towards Coquetdale and the farm of Blindburn (GR NT829108). The area around Blindburn is littered with the `footprints` of those who passed this way before us and who lived their lives on the edge of existence in this remote part of Northumberland. To the west of the present farm, along your return route to Buckham`s Walls Burn, lie the remains of a cairn known as `Devil`s Mothers Grave`. This was excavated in 1970 but revealed no evidence of any burials. A second cairn, which was dug away in 1826 to build a farm house and other buildings, was found to contain burnt bones and ashes inside a broken decorated pot. The cairn undoubtedly marked the position of a Bronze Age burial site. Further up the Blind Burn is the site of a former illegal whisky still, consisting of the remains of a rectangular building and a corn drying kiln. During the 18th and 19th centuries whisky was secretly distilled at a number of locations in the Cheviot Hills and there was a brisk trade in this fiery liquid in the Upper Coquetdale area. The immediate area also contains traces of a medieval or post-medieval period settlement. As you approach the valley a rough track will lead you down past the farm buildings and back onto the narrow, single track road. Turn to your right and follow the road for the short distance to Buckham`s Walls Bridge and the end of your short trip to the wild and windswept northern edge of the Roman Empire.